Where to find the best Mountain Bike Trails in New York State and New Jersey for mountain biking this summer. Bicycle along rocky ledges overlooking lush green valleys then go for a swim in a crystal clear glacial lake surrounded by spectacular cliffs. Go mountain biking on forest roads that wind along pristine rivers, then tube, canoe or kayak down the river for an adventure filled weekend. You'll find trails near waterfalls and swimming holes, sun dappled ponds, secluded lakes and gorgeous sandy beaches. Green Lakes State Park situated just a few miles east of the city of Syracuse is one of the busiest state parks in Central New York and the ideal family staycation getaway. What makes this park special are the two unusual glacial lakes, Green Lake and Round Lake, and the upland forest surrounding them. Although the beach is often crowded during the busy summer months, just hop on your mountain bike to find a peaceful respite on the trail network surrounding the lakes. Mountain bikers know Long Island is one of the best summer mountain biking destinations in New York. For biking at the beach, Hither Hills State Park, located on Long Island's far northeastern shore offers 2.5 miles of white sandy beach along the Atlantic Ocean. Miles of both on road and off road multi-use trails travel through a variety of habitat on a combination of singletrack trails and old woods roads. The 168 site campground, located right on the beach, is considered one of the Top 100 Campgrounds in the nation. This ride is perfect for a summer weekend bike and beach get-away. Minnewaska State Park is our favorite mountain bike destination in all seasons. Forty miles of gravel carriage roads wind around two emerald green glacial lakes, and along the Shawangunk Mountain ridges, offering panoramic views of the Hudson Valley below. Lake Minnewaska surrounded by spectacular white cliffs is conveniently located near the main parking area. It can get quite crowded on busy summer weekends. Lake Awosting (pictured right) requires a mountain bike ride or hike of 3+ miles one-way (no car access). It is usually not crowded and more relaxed. The beautiful rock beach with scenic vistas and bathhouse make this the perfect place to stop for a snack mid ride. Tucked in the southwest corner of the Catskill Park, Willowemoc contains more than 14,800 acres of Forever Wild Forest Preserve. It surrounds the Mongaup Pond, the largest body of water in the Catskill Park. The Willowemoc Wild Forest Trails offer an outstanding variety of trails suitable for mountain biking. Trailheads are easily accessible right from the Mongup Pond campground, which borders the Big Indian Wilderness. The campground and day use area have a sand beach with lifeguard for swimming. Other facilities include a picnic area with tables and grills and canoe & rowboat rentals. The 50,000 acre Moose River Recreation Area, is the largest open grassland in the Adirondack Preserve. A 40 mile network of abandoned logging roads ideal for mountain biking weave throughout the "plains", leading to many scenic ponds and lakes. 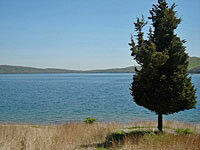 Many New York State Park Campgrounds are situated throughout the area on or between the lakes. Limekiln Lake, with its campground, sand beach and swimming area with lifeguard is closer to the Moose River Recreation Area Mountain Bike Trails. Facilities include a picnic area, bathhouse, nature trail and canoe & rowboat rentals. The Uncas Road-Raquette Lake Bike Tour travels between Fourth Lake and Raquette Lake within heart of the Adirondack Fulton Chain of Lakes in the west-central region of New York State’s Adirondack Park. There are many opportunities for a dip in a cool mountain lake or pond before and after your ride. Eighth Lake, Seventh Lake, Fourth Lake, Limekiln Lake, Brown Tract Pond, Nicks Lake, Raquette Lake. Take your pick. Several New York State Campgrounds offer easy access to the public lake and pond beaches. The two developed areas of Allegany State Park, Red House and Quaker, make this the largest state park in New York. Both areas offer sand beaches, picnic areas, museums, biking and hiking trails. The Red House area, features the Art Roscoe Cross Country Ski Center with over 25 miles of multi-use trails that attract mountain bikers and equestrians in the summer and fall. These wide trails wind through mixed oak and hardwood old-growth forests and offer spectacular views of the surrounding mountains, forests and Red House Lake. The Red House Areaalso features an historic tudor-style Administration Building, 5 miles of paved bike paths, boat and bike rentals, and a sandy beach for swimming and fishing. Located at the eastern end of the Atlantic Highlands both Hartshorne Woods and Huber Woods County Parks together offer about 25 miles of mountain biking on a variety of terrain. Each Park offers it's own unique "flavor." After exploring the trails, head for the shore to cool off. Just a hop and a skip away is the Sandy Hook Bike Path on Sandy Hook, a 2,044 acre barrier beach peninsula located at the northern tip of the New Jersey shore. It is part of the Gateway National Recreation Area. There are seven miles of ocean beaches, salt marshes, hiking trails and a maritime holly forest. Swim only at guarded beaches. You can easily make a day at Parvin State Park a bike and swim combination. Begin your ride at Parvin Grove (Park Headquarters). Several miles of trail take you through the hardwood and cedar swamp habitiats of this hidden gem. Parvin Grove, on Lake Parvin offers a lifeguard-protected swimming beach. Facilities include a bathhouse, canoe & rowboat rentals, concession with food and beach supplies and picnic tables with grills at either end of the beach. There is a campground at Jaggers Point on the southern shores of Parvin Lake and cabins along Thundergurt Lake. cartop launch. No boat rentals are available. Miles of mountain bike trails at the Round Valley Reservoir including the challenging 9 mile Cushetunk Trail offer stunning views of the clear, deep blue waters of Round Valley Reservoir. The water is so clear, it is a popular scuba diving destination. Swimming is permitted at Round Valley in the Day-use Area only in season when lifeguards are on duty. Facilities include public boat launch,campground picnic areas and a beach complex with changing areas, restrooms, showers, a first-aid station, and beach supply and food concession building. Wharton State Forest is the largest single tract of land within the New Jersey State Park System. Throughout Wharton there are hundreds of miles of unpaved roads and trails for mountain biking, hiking and horseback riding. You'll also discover some of New Jersey's most pristine rivers, lakes and ponds ideal for canoeing and wildlife viewing. The Lower Atsion River, a tributary of the Mullica River, has been designated a Wild and Scenic River under the New Jersey Wild and Scenic Rivers Act. Located in the Western section of Wharton State Forest there is a public recreation area with a beach and swimming at Lake Atsion, across from the Atsion Family Campground. Besides the beautiful wooded fully developed Atsion Campground, facilities include several cabins located along the northern shore of the lake, bath houses, hot showers, lake swimming, picnic facilities with grills, a playground and nature trails. Bathing is permitted from Memorial Day until Labor Day with lifeguards on duty (fee).